I’ve been eagerly waiting an upgrade from OpenSolaris 2008.11 that would provide working WPA2 PSK for my laptop, as my laptop is the easiest system for operating system experimentation. I’ve heard stories of success with snv_107, so I decided to give it a shot. Somehow the upgrade from snv_101b to snv_107 was quirky – Xorg didn’t work and ‘pkg fix’ showed such a large number of problems while crashing repeatedly. I decided a fresh installation was called for. 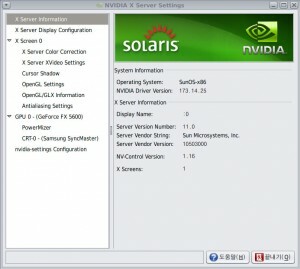 One of the first things I do on new Linux or Solaris workstations is install the closed-source Nvidia drivers. On OpenSolaris, as opposed to my usual OS choice of (Fedora), they come built in and apparently even slightly modified sometimes to work with the latest build. I ran nvidia-xconfig to get a simple configuration in place, and then restarted gdm. The simple fix is to comment out the RgbPath line in the “Files” Section. I restarted gdm again, to find the GLX module now loads nicely, but I still received the same “Failed to initialize the NVIDIA graphics device” message. It seemed like an opportune time to upgrade to the latest Nvidia drivers – 180.29. I suspected that I needed to replace /usr/X11/lib/modules/amd64/libwfb.so and /usr/X11/lib/modules/libwfb.so with the original versions from SUNWxorg-server, as the Nvidia versions appear incompatible with this version of Xorg. Of course, these files were now gone, and of course I had neglected to take a ZFS snapshot. I decided to try out the ‘fix’ feature of pkg. I simply ran ‘pkg fix SUNWxorg-server’ and it correctly identified these two files (and only these two files) as needing replacement. It downloaded them and completed patching in < 30 seconds. My final gdm restart was successful; X started up, and nvidia-settings confirmed the optimized drivers were installed. * I don’t miss Linux’s annoying requirement of compiling drivers against specific kernel versions. * I appreciate that OpenSolaris, like many Linux distros, values end-user experience over open source purity and delivers closed-source Nvidia drivers. I’m certainly tired of performing the Nvidia shuffle on Fedora/RHEL. * pkg fix is nice – downloading only the delta between what should have been installed and what was saved time. * There’s much more information available on debugging Linux problems than Solaris problems, in sharp contrast to 10+ years ago when I was a full time Solaris junkie. * WPA2 is flaky. In fact, it may be wireless in general, but on my laptop it randomly flips between trying to use an unplugged wired port and the wireless adapter. * Not taking a manual snapshot before installing the Nvidia drivers. ZFS makes it so simple, there’s not much of an excuse. OpenSolaris actually takes snapshots for you when you run ‘pkg fix’ – very nice.